Tesco Hudl review | What Hi-Fi? With its seriously cheap price tag and connection to a popular supermarket, it would be all too easy to judge the Tesco Hudl tablet before we even review it. 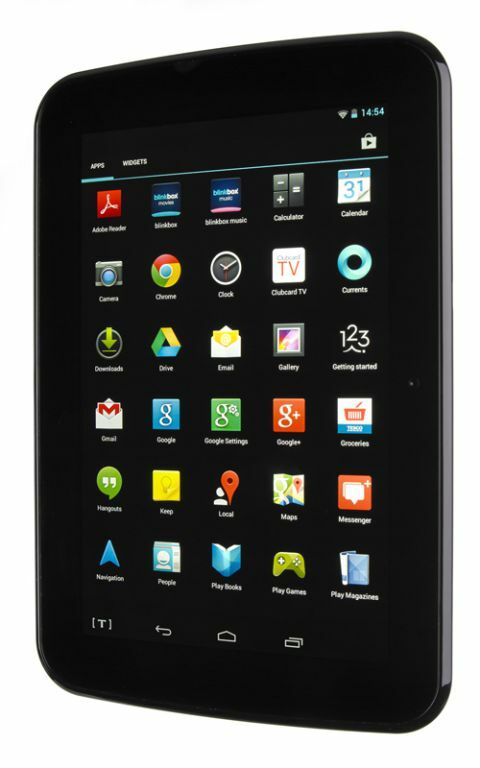 But that would be a mistake – it’s a better tablet than many of its pricier rivals. No, it’s no iPad Mini… but it’s not trying to be. At £120 (or as little as £60 if you use Tesco Clubcard points towards it), it’s not aimed at the same audience as the £330 Apple device, but you still get an awful lot for your money. Its spec list makes for good reading, for a start. The Hudl tablet has a 1.5GHz quad-core processor, a 7in screen with 1440 x 900-pixel resolution and 16GB of on-board storage, expandable via microSD card. There has been some scrimping on RAM at just 1GB, though, and the plastic body doesn’t look or feel quite as elegant as some, even if it feels solid enough. Tesco has done well not to push itself too heavily on the Hudl either – it’s running stock Android 4.2.2, with a few pre-installed Tesco-based apps and widgets that can be deleted if you like. The only permanent Tesco branding is a small ‘T’ icon in the bottom left-hand corner, which launches a hub of all things Tesco. It’s useful for customers, we expect (ordering shopping, checking Clubcard points etc), but equally easily ignored if not of interest. Blinkbox (Tesco’s movie streaming service) and Blinkbox Music (a radio-style app that lets you download stations for offline listening) also come pre-installed. The latter isn’t likely to come into much use for anyone with a Spotify Premium account, but the movie service could well do. It offers a more up-to-date selection of films than the likes of LoveFilm or Netflix, and titles can be rented or bought individually – no subscription required. We struggled to find any in HD though, which is a shame considering they’re available on the Blinkbox website. Using the Hudl throws up no real dramas – it’s snappy enough, and moving around menus and apps doesn’t trouble it one bit. Browsing, movie streaming and game playing are a largely smooth, stutter-free experience, though the more graphic intensive games do ask a few more questions of it at times. The Hudl’s screen is relatively sharp with a respectable 242 pixels per inch, although the new Google Nexus 7 would beat it for clarity thanks to its Full HD display. We had an issue with the screen brightness, though: it doesn’t go as bright as the Nexus 7, which makes outdoor use harder, particularly in sunlight. This also affects video performance, with colours looking a little washed-out, and blacks failing to get as deep as we’d like. Whites are on the warm side too, so you don’t get a great deal of punch from either end of the spectrum. When it isn’t sat side by side with one of its pricier rivals, though, the Hudl’s performance is more than acceptable for its cost. Colour reproduction could be better, but detail levels, image clarity and motion all go in its favour. You’ll want to keep a polishing cloth nearby though – just a short time with the Hudl will turn its screen into a smudgy haven for fingerprints. You can use the Hudl in portrait orientation, but it’s optimised set up for landscape use – as the positioning of its logo and the rear camera suggest. It seems rather an oversight, then, that the Hudl’s stereo speakers are in the exact places your hands go. We recommend using headphones for extended listening sessions or watching movies. Do that, and tonally, it’s well balanced and doesn’t sound harsh in the treble or overly bassy at any point. However, it lacks the precision heard in big-hitters such as the new iPad Mini with Retina Display, and can sound confused with complicated sections of music. A little more punch and excitement wouldn’t go amiss either. Battery life falls just a little short of the advertised nine hours of video, but that could be because we had the screen whacked up to full brightness the whole time. If you can get by on 50 per cent brightness, you’re more likely to get closer to a full day of use. The 3-megapixel camera is no great shakes. You can touch the screen to focus it, but you wouldn’t know a lot of the time, as images are regularly slightly blurry and lacking sharpness. Brightly lit scenes will come out the best, though – it fared much better outdoors – and the same goes for the front-facing camera, which is pretty grainy once the light dips anything below the best. However, many shortcomings are easier to swallow at this price, and for the average user the Tesco Hudl tablet will prove itself to be a great multimedia tablet. It covers the basics and then some, and it does them well. Tesco has been very clever here: compromises have had to be made, so the company has concentrated on the areas that matter most, producing a tablet that’s thoroughly enjoyable to use, at an accessible price. Very clever indeed.